How about these names together…? 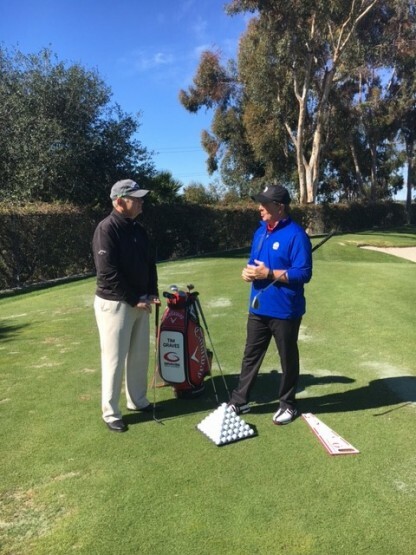 This past year I had the wonderful opportunity to spend some time at Callaway Golf with Roger Cleveland discussing the new Moe Norman Signature wedge(s) we created with Callaway Golf. As some of you know, about 2 years ago, Callaway Golf Corp. contacted me and we discussed creating a Moe Norman Signature wedge line in conjunction with their wedge system designed by Roger Cleveland. Of course, we agreed, and about 9 months later, the “Moe Norman Signature” wedge was born. Callaway Golf – Assume everyone knows about Callaway Golf. Rated as the top golf club manufacturing company in the golf industry and at this time has the # 1 rated Driver, Fairway wood, hybrid, irons and putter (Odyssey). The Mac Daddy wedge created by Roger Cleveland has rated the #2 wedge in the golf industry and is projected to be #1 by the middle to end of this year. Callaway Golf is the leader in the golf industry in R & D (Research and Development) and is known for their innovative standards and the extremely high quality in their products. Graves Golf Academy / Moe Norman – The Graves Golf Academy teaches the Moe Norman single plane golf swing (has done so for the past 20 years) and is the leader in the golf industry in teaching the single plane swing. The Graves Golf Academy also holds the trademark and intellectual property rights of Moe Norman in which we are responsible for protecting all rights/trademarks, etc. of Moe Norman and his estate. Roger Cleveland – Roger founded the Cleveland Golf Company in 1979, and quickly become one of the leaders in the golf manufacturing and equipment in the golf industry. In the 1980’s he produced at that time, the top-selling wedge (588) and was rated as the top wedge in the golf industry. He sold the company in the mid-80s at which time he was asked to join Callaway Golf by Ely Callaway. He has been with Callaway for 21 years in which time he has helped design and implement many of Callaway’s clubs and in particular their highly rated wedges. Roger Cleveland is known in the golf industry as a master wedge designer, creator, and builder. Anthony Taranto – Anthony is the “artist” at Callaway. Some of you might have seen all the different color schemes and designs Callaway has put in their wedges for different individuals. Anthony helped us design the look and color scheme for the Moe Signature Wedge. It is a Callaway Mac Daddy (IV – 2018 version) wedge designed with Moe’s characteristics (what he liked) in a wedge. In other words, it has the highest technology in the wedges (grooves, face, etc…) with the characteristics that make it the perfect single plane wedge(s). Grooves – the grooves of the wedge(s) were created and designed by Roger Cleveland to give the wedges optimal spin and feel in the short game. Each different wedge (pitch vs. gap vs sand vs lob, etc..) are designed with different grooves as each club is used in different circumstances and requires different spin. This is called Progressive Groove Optimization System. Grind – the grind of the sand and lob wedges are a C type grind. This grind allows the leading edge of the club to remain close to the ground when ball position is adjusted back, to mid to forward in the stance. In particular, with the lob wedge – when lob/flop type shots are played forward in the stance, the leading edge of the wedge must stay close to the ground. If not, you will thin, blade or even top these type of shots. (Moe used to grind the leading edge of his wedges to create this C-grind in his wedges before this technology existed). The grind of the gap wedge is an S-grind. A grind that has a “straighter” leading edge on the club. Shaft – The shaft is a steel shaft that is on the “heavier” end of the scale of steel shafts. This is because all wedges are short clubs in comparison to the other clubs in the bag. As Roger said, you must have the feel in the wedges to have a great short game and the only way to keep feeling in the wedges is to keep weight in the shafts. Moe always had steel shafts in wedges and often discussed the feel in his wedges with these shafts. Length – This was a topic I discussed a lot with Roger. We discussed Hagen, Sneed, Mickelson, Hogan, Trevino, Speith, (Moe of course) and a few others. One very common similarities between all these great players who all had great short games are they played their short game shots by using different heights in their different shots. I remember asking Moe about this and his response was I don’t play by distance, but rather by “height”. In other words, the higher you hit the shot, the more spin you can create, the lower you hit the shot, the more roll you will have, etc. etc. When discussing with Roger this issue, he talked about how all great players play by height and these different heights and distances are not only created by ball position and loft of the clubs, but by choking up and down on the grip. The more you choke down, the shorter the club, the shorter you will hit the shot, etc. In fact, this was so important to Moe in his short game, his wedges were slightly longer than conventional wedges so he could choke up and down on the club for maximum feel and optimal height/distance control in his wedges. We have added this to the Moe Wedges – making them slightly longer for each individual fittings to accommodate for this characteristic. Leading Edge of the Wedges – Moe liked having a slightly rounded leading edge in his sand and lob wedges and a “flatter” leading edge in his pitch and gap wedges. The reason has he wanted a leading edge that would “cut” through the grass/ ground/sand, etc. in his shorter type shots (sand and lob wedges) and a leading edge that would be a little more “square to the target” in his longer wedge shots (gap and pitch). This is exactly the way the Mac Daddy C grind (lob and sand) and S grind (gap and pitch) wedges are designed. Grip – The Graves Golf Academy Moe Norman specialty grip in on all the wedges. 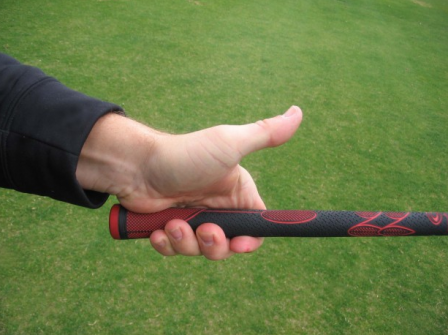 This grip is fit to an individual’s hand size to optimize feel and release in the wedge. Roger absolutely loved our grip. For two particular reasons. 1. It has to mark in which you can choke down on the grip and keep your trail hand in the proper rotation when choking down. And 2. The grip has a mark for the lead hand grip thumb position. He discussed how critical it was to have the lead hand thumb in the correct position on the grip to have the wedge “work properly”. He also discussed how some many average golfers have the lead hand thumb in the wrong position and can’t work the wedges properly. An improper hand position will not allow for proper club head movement which leads to bad mechanics and obviously a poor wedge game. 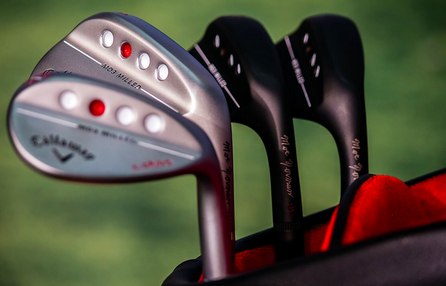 Lie angle – The lie angles of good player’s wedges (Moe’s included) are slightly flatter than the rest of their clubs (set). The reason is as you choke down on the club and/or drop your hands slightly to create more loft on the club, the wedge needs to be a little flatter to accommodate. The Moe Signature line wedges when custom built are set to these standards for each individual (in particular in the sand and lob wedges). 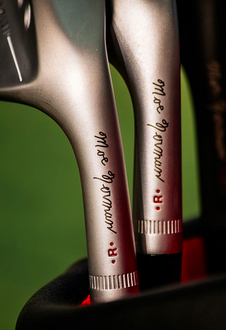 Signature – Each wedge has Moe’s signature laser etched on the neck of the club. This signature is unique to only these wedges and signifies the wedge was designed with Moe’s uniqueness and characteristics of his wedges. 48, 50, 52, 54, 56, 58, 60 and 64 degrees. They are also available in Chrome or Matte Black finish. Each wedge will be customized for an individual’s fittings for length, lie angle, shaft flex (steel), grip size with the GGA specialized grip, etc. using the individual’s size in conjunction with the wedge’s unique characteristics (listed above). I recommend including the lob (58, 60 or 64*) and sand wedge (54 or 56*) in everyone’s bag to maximize their short game. Many should also add the gap wedge (50 or 52) if they do not already have one with their current set. As Roger said (and is our (GGA) core believe) – everyone should have a GREAT short game. And with the correct equipment, correct fundamentals, and practice everyone can have a great short game. As 75% of scoring occurs in the short game, this will eventually lead to a great golf game. The introductory price of the Callaway MD Moe Norman Signature wedge(s) is $159 per wedge. Please contact me timg@moenormangolf.com if interested or if you have any questions. As each wedge is custom built to each individual, it takes about 2 weeks for the wedges to be complete from time of order to shipment. PS. 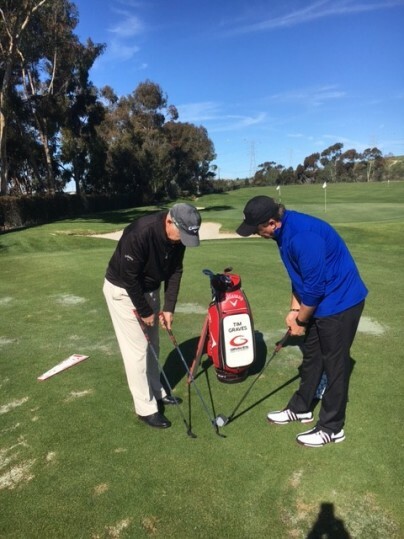 I filmed about 1 ½ hours of video with Roger Cleveland at the Callaway Performance Center in Carlsbad, CA. Discussing the Moe wedge(s), his philosophy of wedge design, all the great players he has worked with, Moe and Moe’s wedge game and wedges (had some with me for Roger to see, etc..), etc. We will work on your custom fitting.